A bare-breasted Zealandia has had her back to the smog-creating traffic of burgeoning Auckland for nearly 90 years, now. 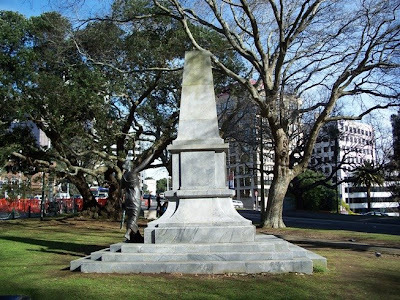 This is the Auckland memorial to those of the fallen among the Imperial and Colonial side during the Land Wars of the 19th century. It was organised by the Victoria League, and unveiled in 1920. The Victoria League was founded in London in 1901, a time when Queen Victoria had just died, and the Boer War was soon to follow suit. The guiding principle of the League was “the conservation in memory of Queen Victoria, of the deeds of British soldiers and sailors, and other patriotic men and women in the Empire, and the assistance and hospitality shown to overseas visitors in England.” A meeting in Parnell in 1909 led to an Auckland branch being established. A Graves Committee was set up in 1910 to search out and tend to the graves of New Zealand War veterans. Realising that many of these graves were unmarked, and that not all the names of the fallen could be recovered, Edith Mary Statham (1854-1951) and the Committee set out to erect a monument in Auckland to all the soldiers who had fallen during the Land Wars. In 1911, a triangular reserve site at the corner of Wakefield and Symonds Street was offered by the Auckland City Council. Sir Joseph Ward had already pledged £100 from the Government towards the project. Onehunga architect John Park won the initial design competition, but his plan was not adopted. 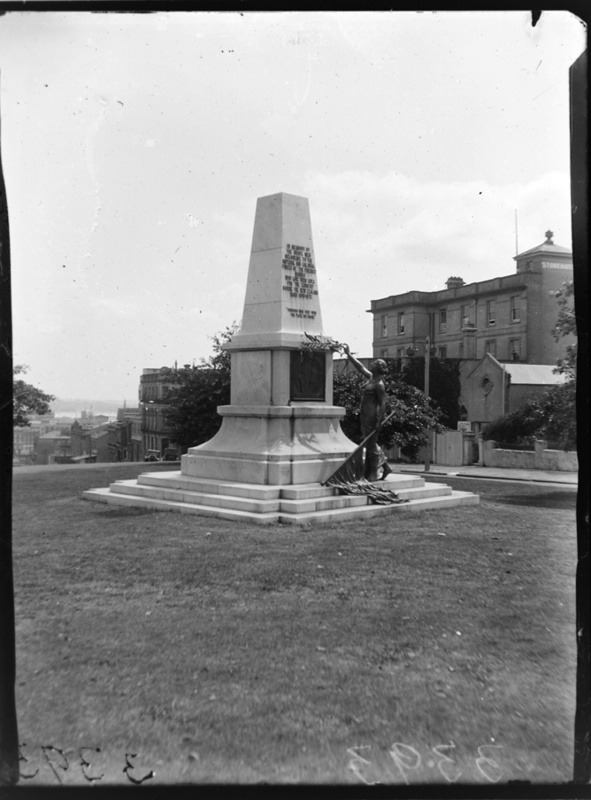 "Showing the memorial on the corner of Wakefield and Symonds Street, Auckland of men who fell in the New Zealand Wars", Reference 4-3393, Sir George Grey Special Collections, Auckland Libraries. In 1913, the Government raised its offer to £1000, and now a second competition was held, this time won in 1914 by British sculptor Thomas Eyre Macklin (whose entry arrived late, and who was chosen despite the disgust of local sculptors and monumental masons such as W. Parkinson). Macklin (1867-1943) was born in Newcastle –on-Tyne who exhibited at the Royal Academy from 1889 and also at Paris. 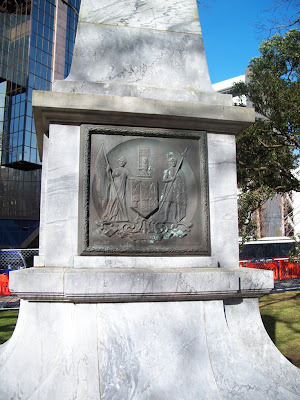 In his obituaries, among his works is included “the Auckland War Memorial”. This isn’t the Cenotaph outside the Auckland War Memorial Museum, however – it’s the Maori War Memorial at the top of Wakefield Street. 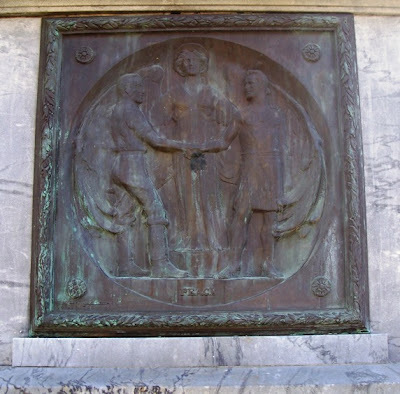 His design incorporated the three steps from Park’s earlier design, as well as the obelisk, but had a draped female figure representing Zealandia offering a palm to those who had died for the country during the Land Wars. 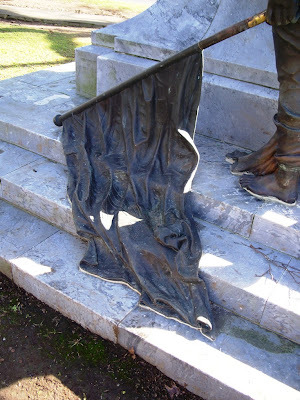 The names of the sculptor and the Paris foundry where the statue was cast are engraved at the edge of the flag which drapes, as if of cloth rather than metal, down the steps. This is my favourite part of the monument. 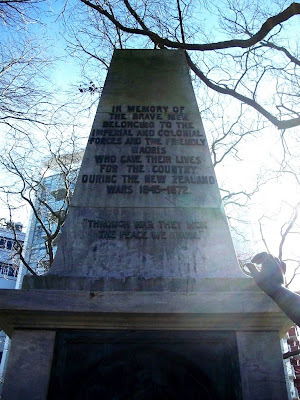 The wording of the monument attracted debate; the Victoria League wanted “and Empire” added, while others disputed the original dates of the Wars revealed as at the unveiling on 18 August 1920. The monument was altered so that “1845-1866” was changed to “1845-1872”. Soon after the unveiling, the monument was got at by the city’s larrikins. The palm leaf soon disappeared, so today Zealandia doesn’t offer peace to the fallen; it appears almost as if she’s reaching up to pick something off a tree or a bush which is no longer there. It’s a pity that palm couldn’t be restored. 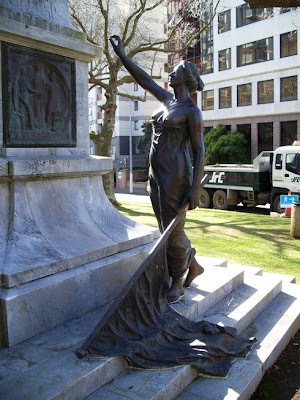 Still – this is a memorial to the British, Australians and New Zealanders, along with the Maori allies, who fought during our civil wars in the 19th centuries. In the flood of memorials since to World Wars 1 and 2, this at least is something different. 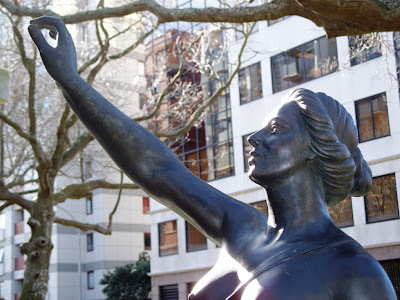 "Once more a national amnesia descended about the New Zealand Wars, as New Zealanders struggled to forget about the conflict lest it upset their naive belief that they had the best race relations in the world. Edith Statham had retired from government employment in 1928, and although from a new position as honorary inspector of war graves for the Auckland RSA she continued to write imploring letters to the government about the subject through until at least 1941, she had become a lone voice. Statham died in 1951, virtually unrecognised for her work."